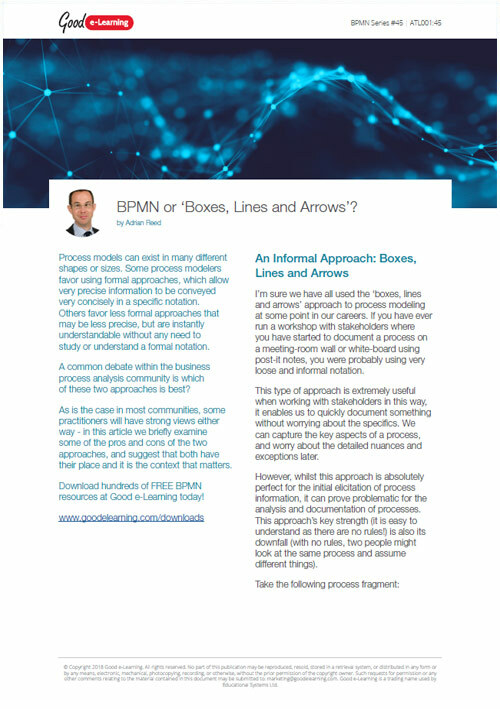 BPMN Essentials - BPMN or 'Boxes, Lines and Arrows'? Process models can exist in many different shapes or sizes. Some process modelers favor using formal approaches, which allow very precise information to be conveyed very concisely in a specific notation. Others favor less formal approaches that may be less precise, but are instantly understandable without any need to study or understand a formal notation. A common debate within the business process analysis community is which of these two approaches is best? As is the case in most communities, some practitioners will have strong views either way - in this article we briefly examine some of the pros and cons of the two approaches, and suggest that both have their place and it is the context that matters.